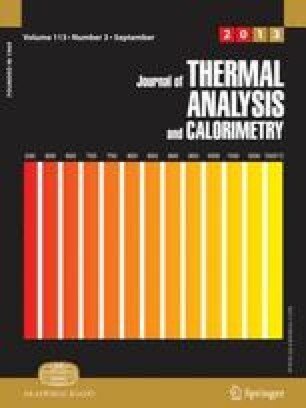 Thermodynamic quantities of the aragonite → calcite transition, were evaluated using results of calorimetric investigations. (1) Dissolution enthalpies of the CaCO3 polymorphs aragonite and calcite measured near room temperature with different calorimeter, (2) the enthalpy of the spontaneous phase transformation obtained by differential scanning calorimetry, (3) heat capacities and heat capacity differences determined with a heat flux calorimeter as well as previously determined, (4)e.m.f. data on Gibbs-energies of the phase transition were processed simultaneously with an optimization routine developed recently. The optimized data set (25°C) given below corresponds reasonably with CODATA recommendations, however, the precision has markedly improved.